At Native Pest Management, we operate under the philosophy that the best way to treat for termites in West Palm Beach is to take action towards making sure that they can never manifest into an infestation in the first place. Because of this, we offer West Palm Beach termite control for pre-construction homes and businesses. What Is Pre-Construction Termite Control? Pre-construction termite control is a preventative approach to termite control. When most people think of the most vulnerable stage of construction, they tend to think of the framing process when most of the buildings structural wood is exposed to the elements — and potential pests. While this is a vulnerable stage of the construction process, the pre-construction stage is arguably the most important stage of treatment here in the South Florida area. Pre-construction is the stage of development where preliminary planning and engineering are used to determine the initial steps of construction. During this stage of construction, there is typically a semi-established or already-constructed foundation and the builder is preparing to begin building the physical structure. In the West Palm Beach area, the pre-construction stage is a critical time to begin termite control. In South Florida, we have a number of termite species, but the most threatening to new construction would be termites of the subterranean variety. Specifically, in the West Palm Beach area, five native and non-native subterranean termite species plague new construction — and do so by accessing the structure through the soil. How Can Native Pest Management Help? When it comes to pre-construction termite control, there are a couple of ways that our termite management team can help. One of the most important considerations that we make when treating pre-construction home or business site is the condition of the soil, and how it could act as a vector for termites looking for a place to become established. Below, we have listed a few of the more common termite control practices. Soil Treatment – When planning a pest management plan for a pre-construction home or business, the first thing that comes to mind is soil treatment. There are many different types of soil treatment, and the treatment that is chosen is dependant on each individual location. Some of the more common soil treatments involve chemicals that are sprayed or buried where the concrete slab is to be laid at a later date. When you contact us to inquire about our termite solutions, one of our pest control specialists will be able to give you a better idea of the treatment that we intend on using at your pre-construction site. Baiting Systems – While chemical applications are an essential tool in pre-construction termite control and termite infestation prevention, there are alternative ways to decrease the likelihood of termite presence. One of the best additional termite prevention solutions is to place termite baiting systems on the property. Rather than keeping termites away from the structure by triggering a negative chemical response, baiting systems lure them away using attraction — catching them and preventing them from manifesting into an infestation in the structure being constructed. 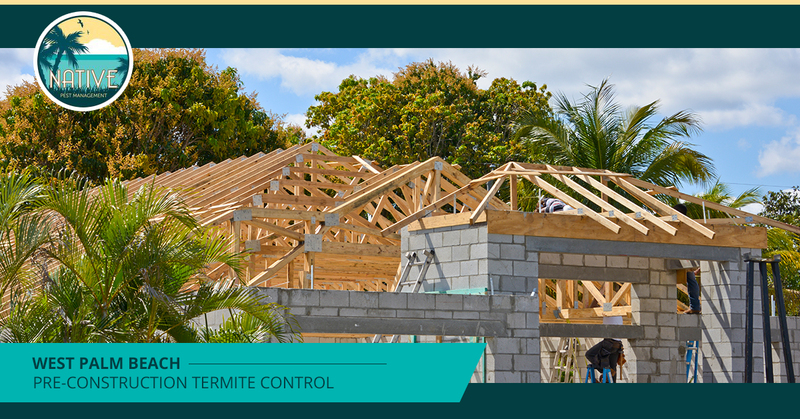 To learn more about the termite baiting systems that our West Palm Beach termite control company uses on our pre-construction and post-construction properties, click here. At Native Pest Management, we provide the greater Palm Beach County area with innovative pest control solutions. If you are a contractor who is building a home or business in the area, we strongly urge you to inquire about our pre-construction termite solutions. Our team of talented termite prevention specialists will visit your build site, provide you with an estimate, and apply our integrated pest management strategies to the future home or business site. If you are in need of West Palm Beach termite control solutions, contact us today.